Place Value Chart Games Are Great For Teaching About Numbers. Kids need to learn Place Value because it helps us determine the value of numbers. A Place Value Chart shows the position of a digit in a number and its place value. The first number on the left is 5, and we see that it is in the ten millions place. So that means our number will have 5 5 ten millions or 50,000,000. The next number is 3, which is in the millions place. So this means 3 millions. The next number 7 is in the one hundred thousands place. So we will have 7 one-hundred thousands. The next number 1 is in the ten thousands place. So this means we have 1 ten thousand. And so on for the rest of the numbers. Do you get the picture? Whole Numbers are always written to the left of the decimal point. Decimal numbers are always written to right of the decimal point. Looking at the number 53,712,009.328, in our chart, we can see that 3 is in the tenths place, so the 3 represents three-tenths. And the 8 is in the thousandths place,so it represents eight-thousandths. 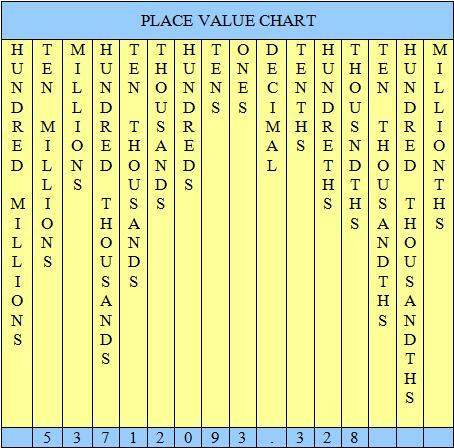 Decimal Place Value Chart: Now here's another place value chart. It also will provide a table to show how decimal numbers are written in words, written as fractions, and then written as decimals. Place Value Activities: Once students learn a little about the meaning of place value, it's nice to be able to have some fun activities where they will enjoy practicing place value. Really Big Numbers: Do you want to know how to name really big numbers? This page will show you the name of huge numbers, bigger than a million or a billion that most elementary school students have heard of. We've pulled together a variety of place value activities and games for parents and teachers to use that will make understanding numbers a lot more user-friendly for kids.